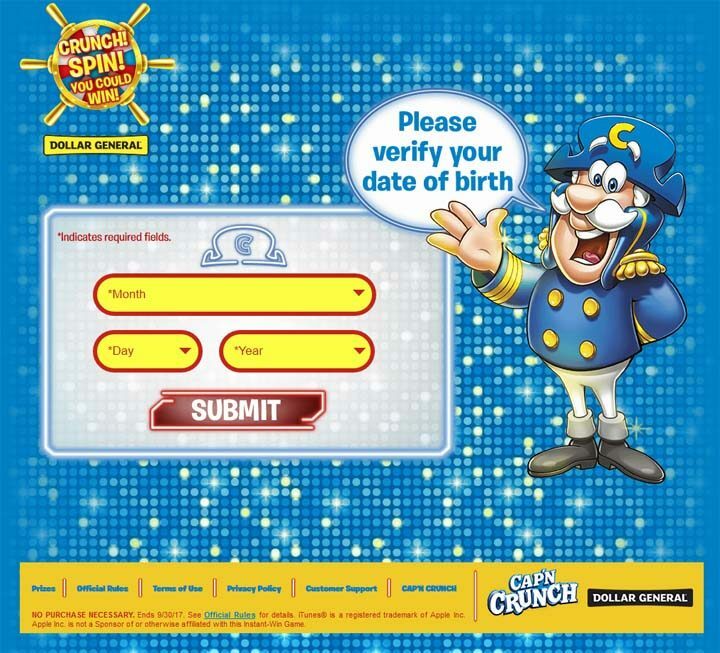 The QUAKER CAP’N CRUNCH Crunch Spin You Could Win Instant-Win (CrunchSpintoWin.com/amoe) is open only to legal residents of the 50 United States and the District of Columbia who are 18 years of age or older. The QUAKER CAP’N CRUNCH Crunch Spin You Could Win Instant-Win ends at 11:59:59 p.m. ET on September 30.
a) Make a purchase: An eligible participant may purchase specially marked Cap’n Crunch cereal boxes at participating Dollar General locations. One (1) Code will be printed inside the specially marked packaging. b) Without a Purchase (Mail-In Code Request): To obtain a Code without making a purchase, via mail-in request, an eligible participant must legibly hand write his/her full name, complete street address, age, and valid email address on a 3½” x 5” postage prepaid, properly stamped postcard and mail it to: Quaker Crunch Spin You Could Win InstantWin Game Code Request, P.O. Box 251328, West Bloomfield, MI 48325.
c) Without a Purchase: To obtain a Code without making a purchase, via online request, an eligible participant may go to CrunchSpintoWin.com/amoe and follow the on-screen instructions to obtain one (1) Code via email. The total ARV of all Prizes available in the Game is $18,250.